I’ve had a couple of bottles of this wine, and I was a little disappointed with the first, but I think that was my fault, as the second was much better. I have lots of prejudices (prejudi?) about wine, what I think I’ll like and how I think I’ll like it. They normally work in my favour, but this time they didn’t. When I see Syrah, or any Cote Du Rhone style red I think thick warming spicy baked goodness. I prepare for an alcohol hit and slow baked fruit. That’s why this wine was disappointing first tie around, it didn’t deliver in that way, despite spending a little time making its way up to room temperature and taking the air. 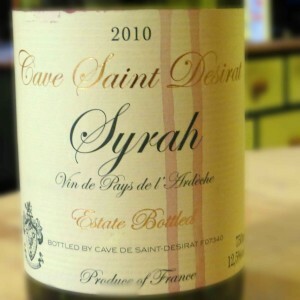 Second time around with Virgin Wine‘s Cave Saint Desirat L’Ardeche Syrah I paid a bit more attention to what the winemaker said about the wine – it’s not supposed to be meaty beaty big and bouncy, it’s only 12.5% alcohol, a pop by Rhone standards. It’s meant to be easy drinking, lighter, fruitier, but still with some spice. Second time around I didn’t mess about with getting the temperature up, I served it as it came out of the “cellar”, or rather more prosaically, the space by the back door, by the loo only used in gardening emergencies. It’s cool out there. It tasted better, the red fruits came out more, the pepper was more noticeable. It wasn’t quite black pepper on strawberries, but it was close. Instead of thinking of this as a winter warmer, which it’s really not very good at being, I re-framed it as a spring refresher, and it seemed far more at home in that space. I don’t think people who want to buy an affordable Shiraz are going to love this wine, and people who want a lighter, fresher wine are not going to choose a Syrah from Southern France. It’s like the funny looking kid who’s really fun when you get to know them, but first, you have to get over the “funny looking” bit.